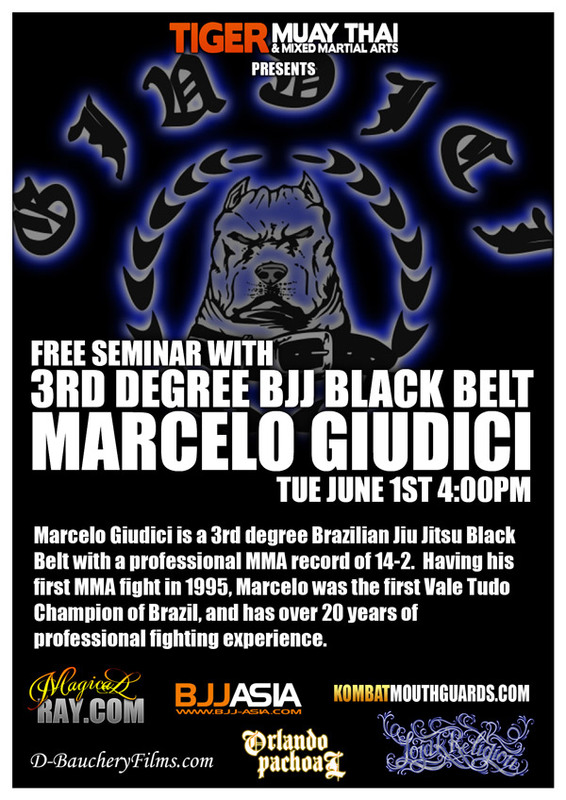 3rd Degree BJJ and Judo Black belt Marcello Guidici gives MMA / BJJ seminar June 1, 2010 @ 4:00 p.m.
Tiger Muay Thai and MMA training camp guests are in for a treat as 3rd Degree BJJ and Judo Black Belt marcello Giudici will be giving an MMA / BJJ seminar on June 1, 2010 @ 4:00 p.m. in the MMA program training area. Ryan Gracie BJJ black belt Marcelo Giudici will be spending the next month training at Tiger Muay Thai and MMA Training Camp, Phuket, Thailand. Also a black belt in Judo Marcelo is an accomplished grappler with notable BJJ accomplishments including; *5x Sao Paulo State Champion *Bronze Pan American Champion *Bronze Mundial Rio De Janeiro Champion Competing in MMA Marcelo has an impressive 14 win, 2 loss record, with his first professional fight taking place in 1995 under “REAL VALE TUDO” rules in Brazil.